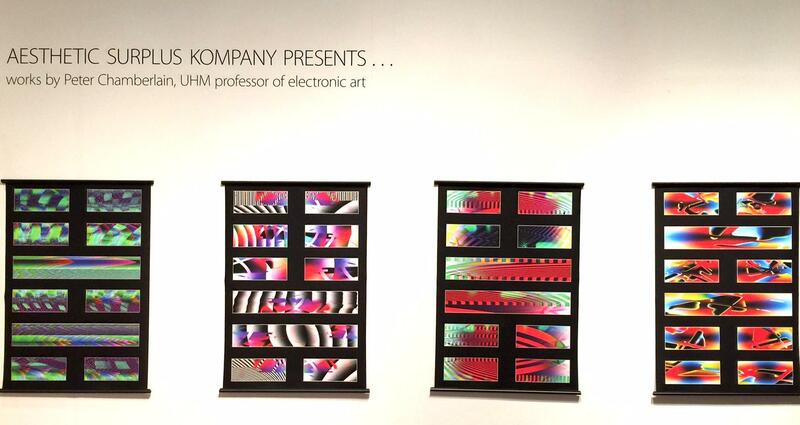 Intermedia artist Peter Chamberlain's exhibition, “Aesthetic Surplus Kompany Presents:” at the UH Manoa Art Building is a live installation that uses natural processes to create audio and visual imagery. Various interactions were designed through the length of the show, including, for example, a butoh performance by Coco Chandelier. The exhibit closes with a participatory non-extravaganza Friday, September 16, between 2 and 4pm. 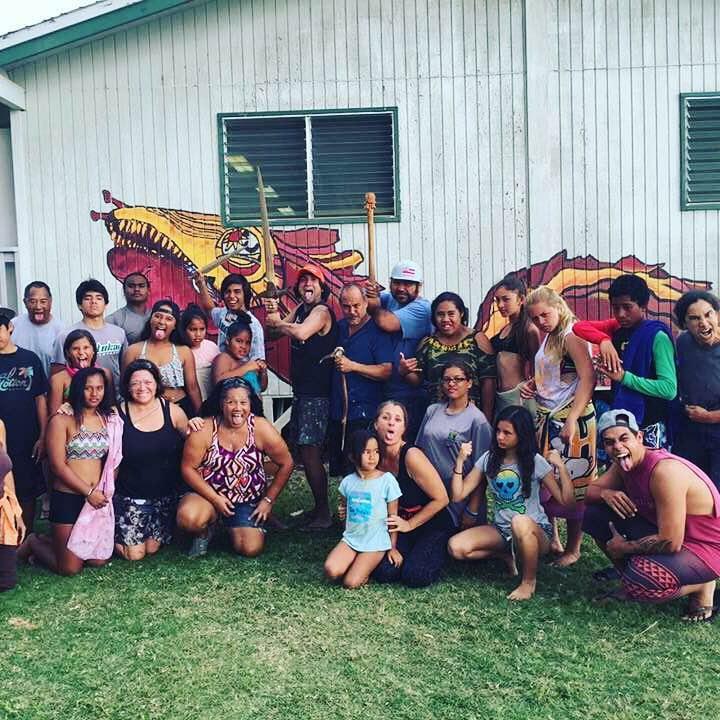 Professor Peter Chamberlain teaches improvisational systems and intermedia in the UH Art Department. 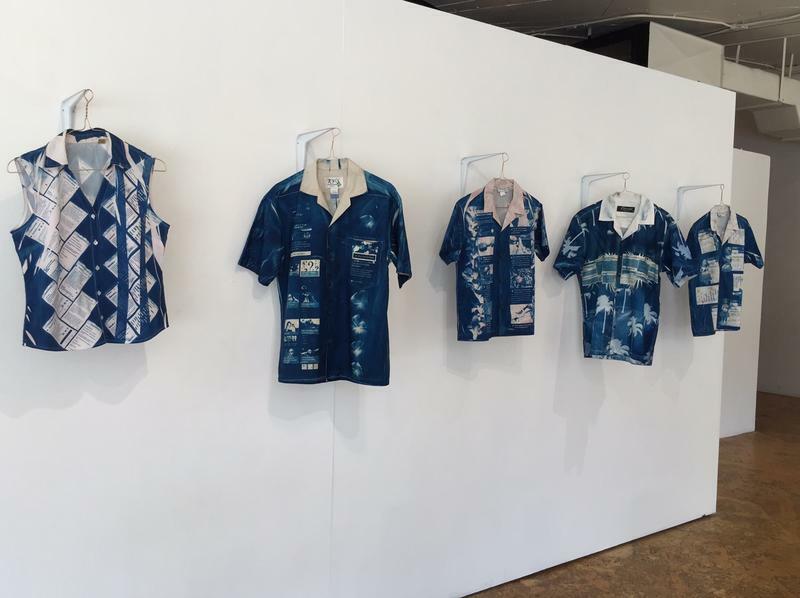 A chat with Peter Chamberlain about the philosophy and ideas behind his current installation at the UH Manoa Art Department. 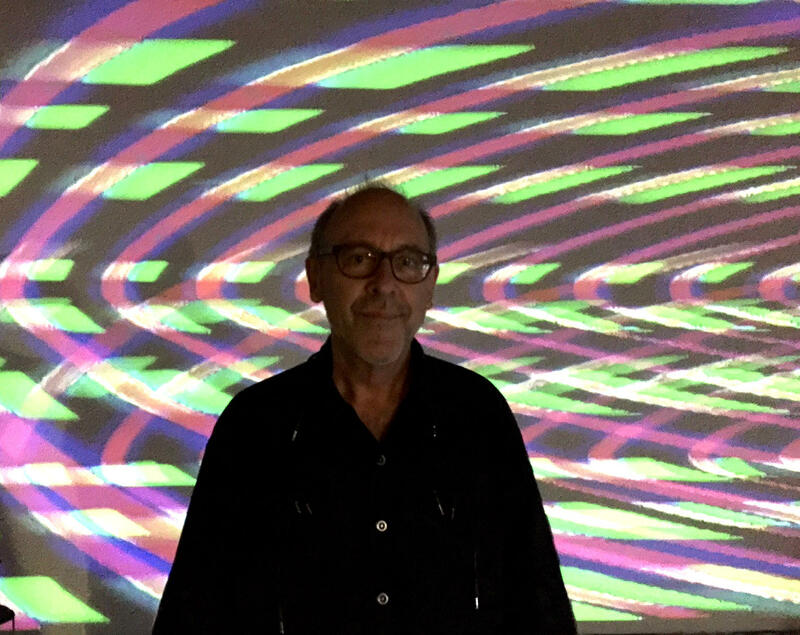 Peter Chamberlain, Professor of intermedia and electronic arts started as a goldsmith, became a sculptor and electronic musician who eventually combined things with performance and sound sculpture, into installations and videos. I asked how these things affect people? The room’s pretty dark and vivid shapes are morphing and twisting on one wall. There are no buttons!!!! This is a totally analog production. Several consoles bristling with knobs and dials control the audio effects. Forget digital and wireless, and love the looping cords and wires. It’s not designed to a T then executed, the process is programmed to a point, then indeterminate. Chamberlain worked with 20th century composer John Cage, who captured the rule trashing experimentation of the time. With several ironic twists like the tchotchke-esque perpetual motion birds Chamberlain painted to look like political candidates. Earlier this year Chamberlain was invited to perform and present in Portland and he made over 200 aluminum hats for attendees—as protection from cosmic rays? Let’s face it, uranium ions are powering a roomful of sounds and images, maybe we should be worried about all the cell phone signals and everything else running through and around us. Chamberlain will have a skateboard ramp in the gallery Wednesday, with skaters to generate the sounds and images. Everyone’s invited to participate in the finale Friday, September 16, from 2 to 4pm. After 25 years teaching and working in expanded arts and media, Peter Chamberlain finds himself being drawn back to early experiments with analog systems. He says there’s been a resurgence of interest in analog audio/visual systems because of the flexibility and variation that’s possible, also, cost and durability issues. His exhibit, “Aesthetic Surplus Kompany Presents:” may look wild, but it’s rooted in a natural process. we have partially exited a period of digital predictability when it comes to using tools like photoshop, and returned to a space of feedback loops and evolving outcomes… much closer to the real world that is not made out of individual pixels. in the larger context, the whole social media system of following and liking surrounds us with the kinds of feedback loops that peter is creating in a local space. 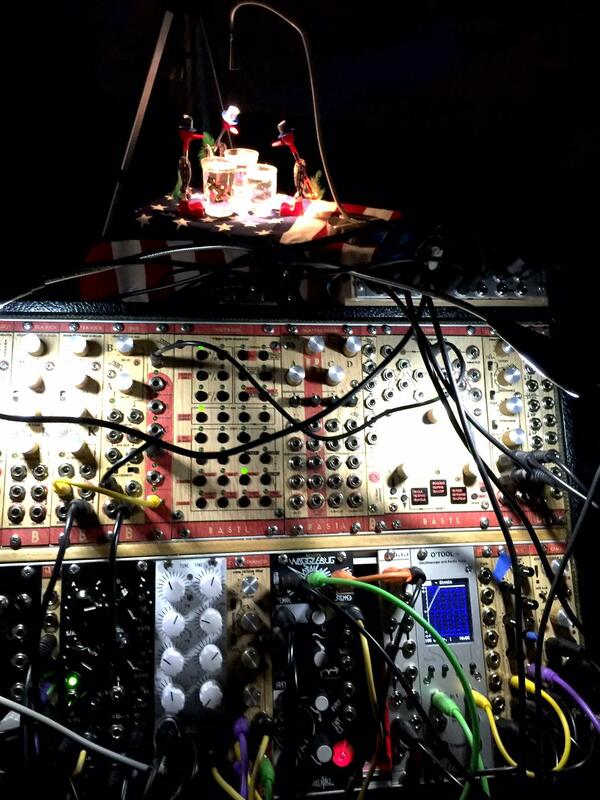 there is a significant movement in audio circles that works with the analog modules and nests of cables that you saw in peter’s installation. there is a good deal of craftsmanship, unique solutions, and artisanship in the design, manufacture and selling of these components. on one hand it’s hipster elitism, but for many folks its also about creating sounds that are not baked into your sampler or digital editing program. 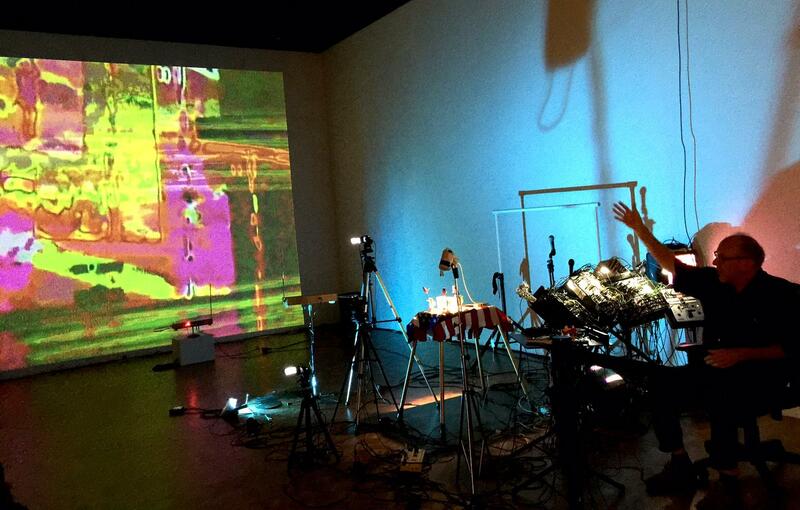 his use of the theremin also represents a passing shout-out to a more nostalgic period of electronic music – but notably, peter doesn’t use them to generate musical sounds, but to generate voltage changes that affect the video processing…. videos that, i might add, are not “self-portraits” but are nevertheless produced in reaction to your motions and gestures… his system is a “portrait of you” but not in the nihilistic or self-centered way that people have grown used to with their video games and instagram accounts.